Sometimes, a slice or two of humble pie is necessary component to winning a state title. 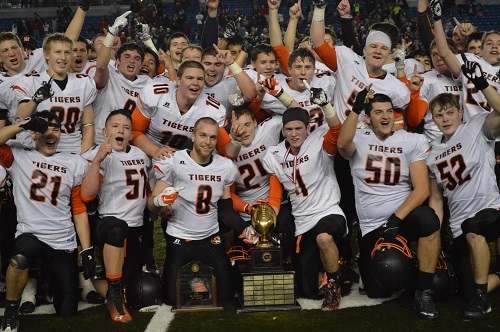 For Coach Josh Fay’s Napavine football team, the Tigers will have the chance to change the result of ’14 when they fell to Okanogan 17-14 in the championship game. Additionally, they would need to even the score against Pe Ell-Willapa Valley who beat Napavine in the regular season 28-27. Would the Tigers earn their opportunity to avenge what happened a year ago or would the Titans punch their ticket to the final? The Tigers were successful in moving the ball and racking up yardage early in the first half with balanced attack, but did not convert their drives into points. It wasn’t until the second quarter when the Tigers finally found the scoreboard. Quarterback Wyatt Stanley contributed to both scores with one run and one pass to a diving Chase Van Wyck. These touchdowns occurred after the opening score by Pe-Ell Willapa Valley; a 5 yard touchdown run by Kaelin Jurek. The Tigers recorded 133 total offensive yards in the first half; 99 of which were through the air. Conversely, the Titans were limited to 62 yards all of which were on the ground. Would the defensive clamps break in the second half? The Tigers extended their lead to start the third quarter on a methodical ten-play drive that led to a diving Mac Fagerness reception near the ten yard line where he proceeded to slither through several defenders. Trailing by 15, Pe Ell-Willapa Valley needed a response and they crafted one when Jurek busted through the Tiger goal line formation to cut the deficit. Coach Fluke opted to attempt a two-point conversion to make it a seven point game. The Napavine goal line held strong as Jurek could not repeat what he did a play ago and the Tigers maintained a two-score lead. This uphill battle eventually sunk Pe Ell’s chances to make a comeback and a late pick-six by Cole Van Wyck sealed the deal for the Tigers. 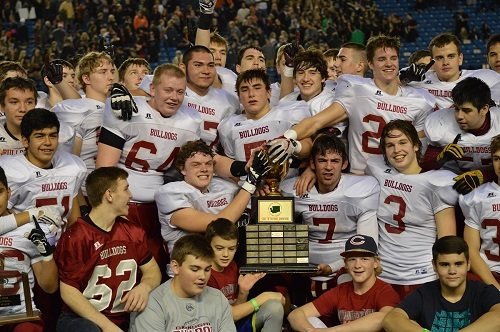 The 2B championship game will be a repeat of last season. After the game, Wyatt Stanley explained “everyone in the community is rallying behind us. 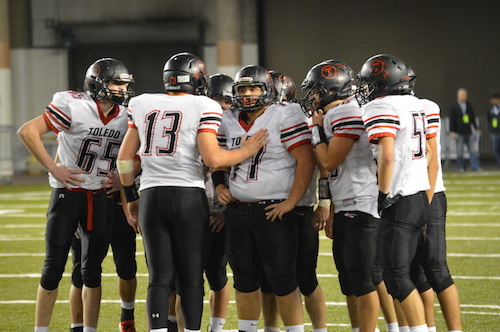 It’s fun.” He also added, “We have to stay focused, have a good week of practice, and finish it.” Expect a different outlook by Napavine this time around. In the 2B playoffs round of sixteen, Sedro-Woolley hosted the Concrete Lions and the Napavine Tigers on a chilly Saturday afternoon. Napavine’s fans came all the way from south of Chehalis, a close to 300 mile round trip to watch their Tigers put on a show, and the athletes did not disappoint. Concrete jumped out to an early 8-0 lead on a 2 yard rush by senior Josh Rogge and a successful 2-point try. Napavine quickly answered with a 4 yard quarterback draw by Brady Woodrum to cut the lead to 8-7. The Tigers then forced a Lion punt and struck again on a long pass from freshman Wyatt Stanley to classmate Mark Fagerness to take a 14-8 lead. Concrete answered on their next drive with another 2 yard run, this time by Gibson Fichter, and a successful 2-point try by Fichter to take the lead back from the tigers, 16-14. 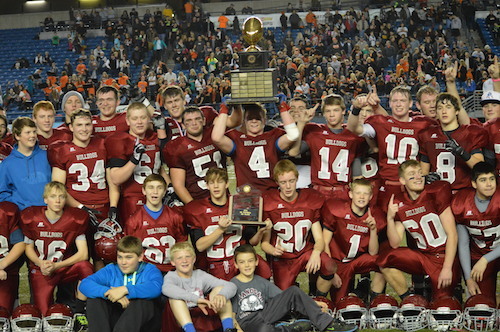 But the Lions would fail to see the endzone again on the day and Napavine began pouring on the points. Two more Wyatt Stanley touchdown passes and two more rushing touchdowns closed the contest for the Tigers, who pitched a shut out in the second half against a strong Concrete club. 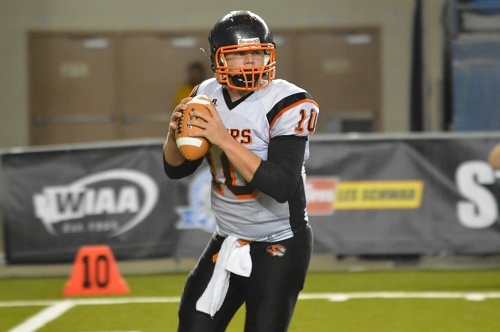 Napavine took care of business and will advance to the state quarterfinals with a 44-16 victory.